looks interesting, I wonder if it has the flashing back and forth of both total and reaction times... or just total time like my expert racers / drag tracks ? looks like it arches over whatever track type you have... didn't see any wires but the start and finish must be connected, says  C batteries ? I have had lots of vintage ford car parts over the years...127 Model As and 101 '32 to '34 bodies, I throw a few on ebay now and then... 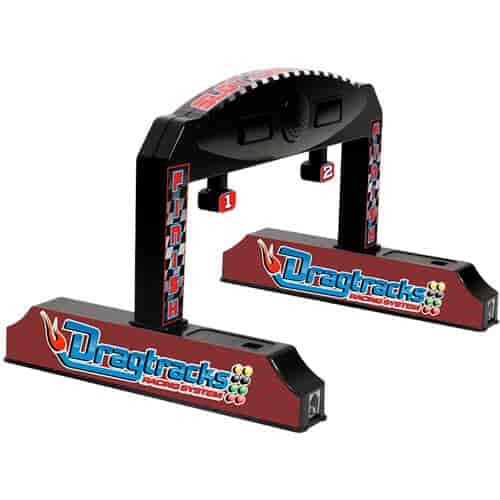 I consider the cash to be funny money... that is how I am justifying the slot / track drag tracks set's $69.99 cost... ordered one Saturday morning... thanks for the heads up DELTA 6. As Delta says this is aimed at the slot car market so there isn't any starter pegs etc. says it can take 1;64 to 1;24 cars for drags.... the track for those biggies appears to be 9" wide... the DT starter and finish line "arches" must be at least that wide...adjustable sensors ? The starter arch doesn't appear to have sensors, if you happen to have a pull cord or electric starter, the fact that the tree is attached to the arch should allow you to set it up at a remote spot, you should be able to start and watch the race from beside the track, better view of the whole run and of the finish... won't get it till mid December rrrrrr ! jeggs said this week, but xmas eve / xmas day... maybe next week ? does anyone know the overall width of 1;24 scale slot car track ?